As close as this blog has gotten to polar waters can be seen here and here. And then there was that polar bear question that appeared here back in 2007 . . . 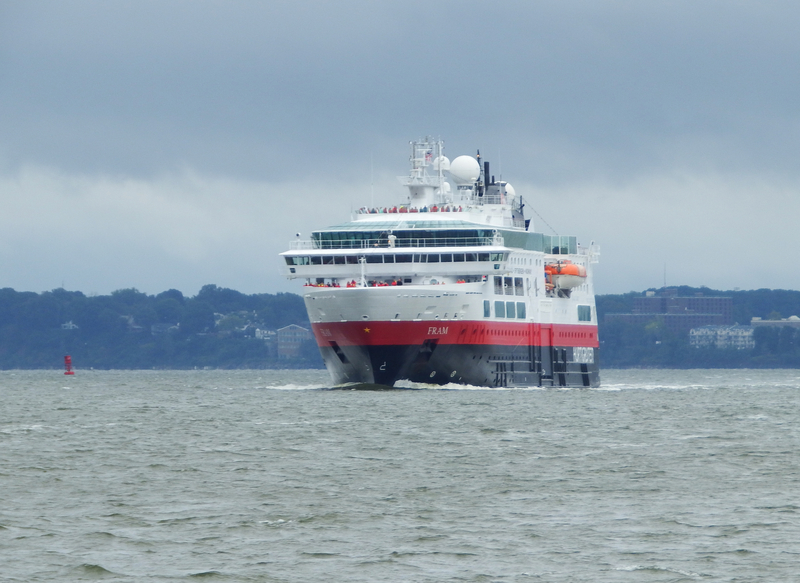 When I saw the vessel above northbound on the Upper Bay on Monday, I had no idea what it was. 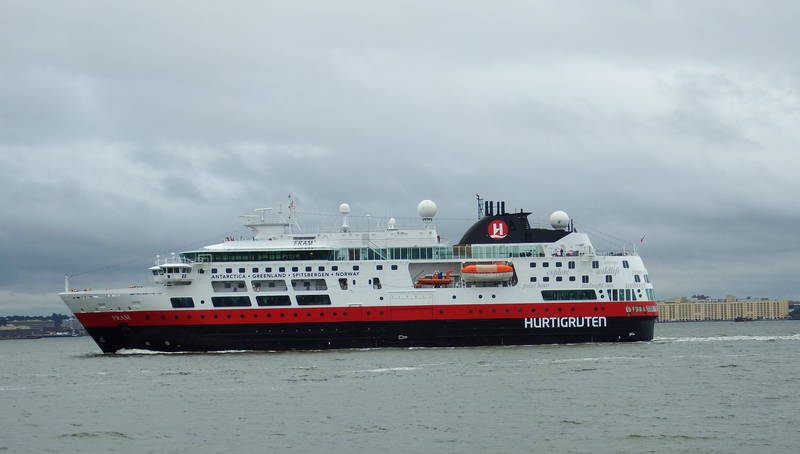 It turns out to be one of about a dozen passenger ships operated by Hurtigruten, a cargo and ferry line since 1893 now offering cruises to the latitudes toward the Poles, North and South. Another vessel named Fram–that one made of wood–was an early explorer of the polar seas. 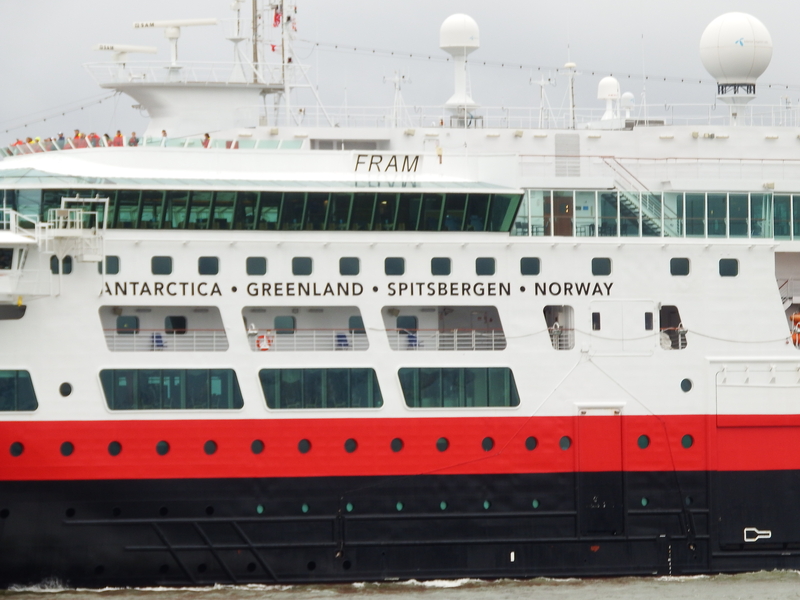 Fram was in the sixth boro for about 24 hours before heading south. 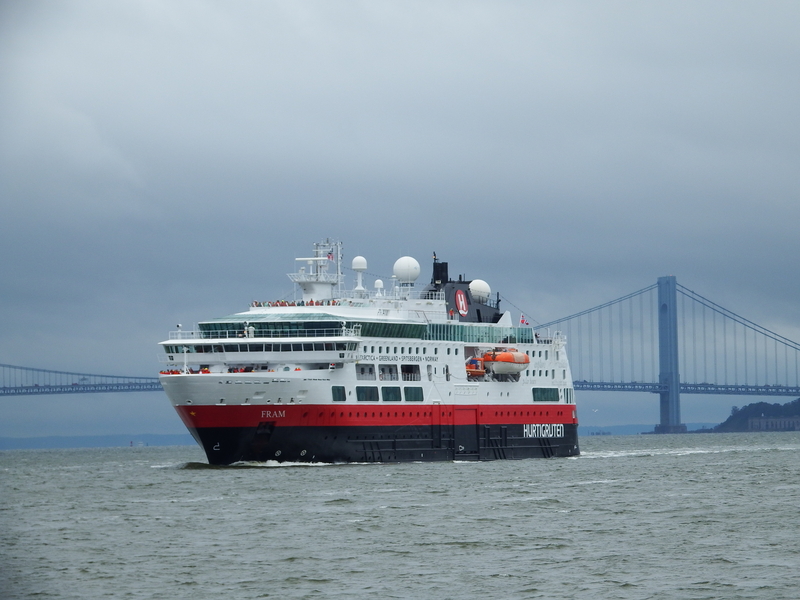 Her port of registry is Tromso, in northern Norway. Very nice run if you ask me. I was on a Navy FRAM destroyer in the 1960s. a (Fleet Modernization and Rehabilitation) program that extended the lives of WW II destroyers built 1944/45. Still the fastest ship I ever rode. 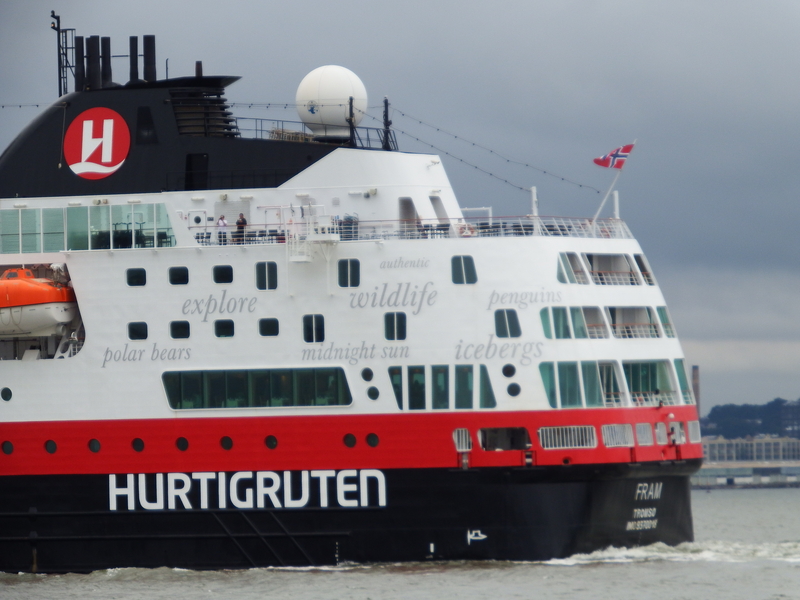 The Hurtigruten has been the bus/post/people service for Norway since 1893. Most of the Norwegian population live on the coast because the hinterland is inhospitable. The many fjords cutting deep into the coastline make road communications exceedingly difficult so the majority of supplies and passengers are carried by ships run by the “Hurtig Ruten” (Express Route) in all weathers. Catamarans have been introduced for some of the inner sea routes less affected by severe weather. 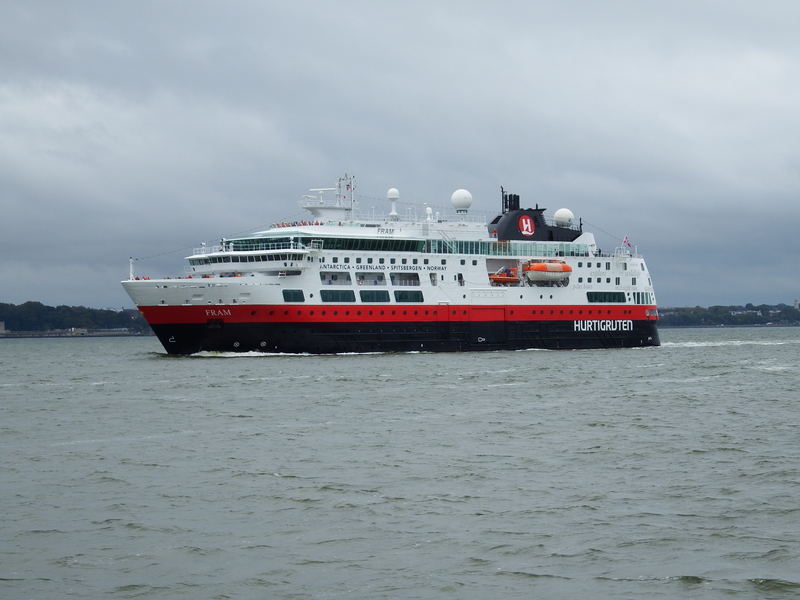 Both offer an excellent way to see Norway. In the early 1900s Kaiser Wilhelm of Germany would take his holidays at the Kviknes Hotel in Balestrand on the Sognefjord, travelling by Battleship with destroyer escorts. A few years ago, I walked around the wooden Fram, the schooner used by Amundsen, they’ve got it inside a museum in Oslo, Norway. It was a bit smaller than this modern one! It was in Bucksport Maine a couple of days ago. It probably seemed rather small in Manhattan, but it dominated Bucksport harbor.